Caddell, D. F., Wei, T., Park, C. and Ronald, P. C. (2015). The Use of a Dexamethasone-inducible System to Synchronize Xa21 Expression to Study Rice Immunity. Bio-protocol 5(9): e1468. DOI: 10.21769/BioProtoc.1468. Inducible gene expression systems offer researchers the opportunity to synchronize target gene expression at particular developmental stages and in particular tissues. The glucocorticoid receptor (GR), a vertebrate steroid receptor, has been well adopted for this purpose in plants. To generate steroid-inducible plants, a construct of GAL4-binding domain-VP16 activation domain-GR fusion (GVG) with the target gene under the control of upstream activation sequence (UAS) has been developed and extensively used in plant research. Immune receptors perceive conserved molecular patterns secreted by pathogens and initiate robust immune responses. The rice immune receptor, XA21, recognizes a molecular pattern highly conserved in all sequenced genomes of Xanthomonas, and confers robust resistance to X. oryzae pv. oryzae (Xoo). However, identifying genes downstream of XA21 has been hindered because of the restrained lesion and thus limited defense response region in the plants expressing Xa21. Inducible expression allows for a synchronized immune response across a large amount of rice tissue, well suited for studying XA21-mediated immunity by genome-wide approaches such as transcriptomics and proteomics. In this protocol, we describe the use of this GVG system to synchronize Xa21 expression. Sow 12-20 rice seeds on filter paper in a petri dish (10 cm diameter) with 10 ml of sterile water and place it in an incubation chamber for one week. Transplant one-week old seedlings into 5 ½ inch pots (three seedlings per pot) and grow them in the green house for approximately another five weeks. For irrigation, keep individual pots in supertubs filled with fertilized water until four weeks then continue filling super tub with reverse osmosis water. Water level should be maintained near the soil surface but not higher to prevent green algae from covering the soil in the pots. A maximum capacity of 24 pots is possible per supertub, but 12 pots are optimum for these experiments to allow spacing between pots. When the flag leaf is fully extended but before panicle emergence (approximately six weeks after germination) transfer plants to walk-in growth chamber for Xoo inoculation and dexamethasone treatment. Allow a minimum of three days for plants to equilibrate to chamber conditions before inoculation. Roots often grow out of the bottom of the pots. Take care to minimize root damage while transferring plants to walk-in chambers. Two days before transferring plants to the walk-in growth chamber, transfer 30 μl of Xoo from -80 °C to a PSA solid media containing cephalexin and incubate at 28 °C for three days until a biofilm is formed. Note: If needed, after biofilm formation Xoo can be stored at 4 °C until ready to proceed, but should not be stored for more than two weeks. Two days before inoculating rice plants, subculture approximately 1 cm diameter of Xoo from the original PSA solid media containing cephalexin to a new PSA solid media containing cephalexin and incubate at 28 °C for an additional two days until biofilm has formed. On the day of inoculation, suspend Xoo from the most recent PSA solid media containing cephalexin in sterile H2O to OD600 = 0.5. Inoculate rice leaves by dipping scissor tips into the Xoo suspension and cutting the leaf approximately 2-3 cm away from the leaf tip of the 1st and 2nd leaves, or just 2nd leaf. Expected bacterial load immediately after inoculation is approximately 1 x 105 cfu/ml (Song et al., 1995). Note: For a non-inoculated control, rice leaves should be clipped with scissors dipped into water alone. Allow five to seven days after inoculation for Xoo to spread from the inoculated region and form a more even distribution across the rice leaves. Note: Five to seven days after inoculation was selected because based on previous experiments (Song et al., 1995), Xoo was shown to be completing log growth phase during that period of time. After seven days, disease symptoms begin to be more visibly pronounced. Prepare 30 μM dexamethasone + 0.01% Tween-20 fresh (400 ml) in 550 ml spray bottle on the day of foliar application. Spray 200 ml of dexamethasone per supertub from a distance of 12-24 inches away from plants, walking around tub as you spray and moving in an up and down motion to ensure spray is being applied evenly to all portions of the plants. Avoid bumping or disturbing the plants at this step or dexamethasone solution will slide off the leaves. If walk-in growth chamber has a strong circulating fan, plants should be placed in a less windy area within the growth chamber for dexamethasone application as the fans will cause dexamethasone to evaporate too quickly and dexamethasone uptake may not be as uniform. Plants can be returned after dexamethasone solution is no longer visible on the surface of leaves (after 1 to 2 h). Harvest tissues at the desired time points after dexamethasone treatment. To harvest tissue, 3 to 5 cm at the inoculated leaf tip were cut with sterilized scissors and immediately frozen in liquid nitrogen. Figure 1. 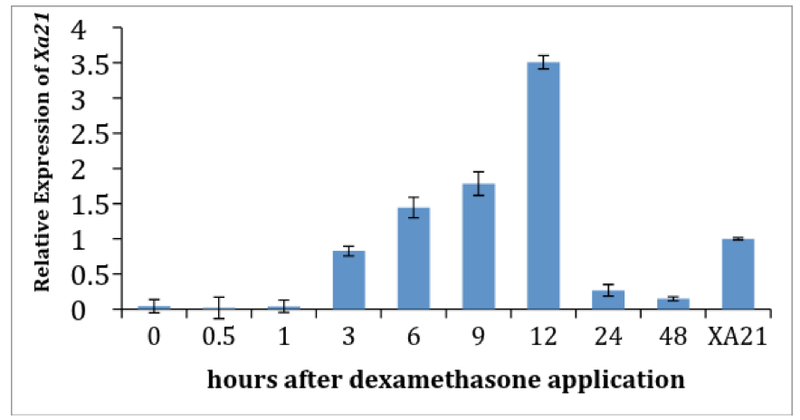 Experimental design using the dexamethasone-inducible system. Six-week old rice plants are inoculated with Xoo. Before dexamethasone treatment, pTA7002::Myc::XA21 plants (A) do not express XA21 and phenocopy the susceptible Kitaake plants (B). 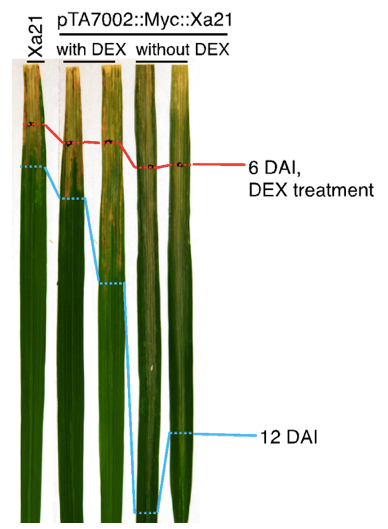 Six days after inoculation, dexamethasone is applied to rice plants and XA21 begins to be expressed, inducing a robust immune response. Leaf tissue is harvested at 0 h, 12 h, and 24 h after dexamethasone application and frozen in liquid nitrogen for downstream applications. Ubi::Myc::XA21 plants(C) overexpressing under the control of the maize ubiquitin promoter (Park et al., 2010) are resistant to Xoo and used as a positive control here. Figure 2. Expression of Xa21 after dexamethasone application. pTA7002::Myc::XA21 rice leaves were harvested at the indicated time points after application of dexamethasone. RNA was extracted using TRIzol with standard protocol; cDNA used for quantitative PCR was transcribed with M-MLV reverse transcriptase; and quantitative PCR was performed with SsoFastEvaGreenSupermix on a PCR machine. The gene expression of Xa21 was normalized using the rice ubiquitin gene (LOC_Os06g46770) as an internal control, and the expression level in the Ubi::Myc::XA21 plants (labeled as XA21) was set as 1.0. Figure 3. Dexamethasone treatment inhibits the elongation of lesion lengths in pTA7002::Myc::XA21 plants. Six week old rice plants were inoculated with Xoo. At six days after inoculation (6 DAI) disease progression was measured (red line) before dexamethasone (DEX) was applied to the plants. Until 6 DAI, pTA7002::Myc::XA21 plants did not express Xa21 and the observed variation in disease development between with DEX and without DEX treated plants was not statistically significant. Disease progression was allowed to continue until 12 days after inoculation (12 DAI, 6 days after the DEX treatment), and lesion length was measured as indicated (blue line). pTA7002::Myc::XA21 plants treated with dexamethasone showed significantly less disease progression compared to non-dexamethasone treated plants indicating that DEX treatment was successful in inducing expression of Xa21 and that XA21-mediated immunity was triggered. “Leaky” expression in the absence of hormone has previously been reported in the chemical-inducible systems (Padidam, 2003; Zuo and Chua, 2000). In our system, about half of the independently transformed rice lines displayed weak or moderate leaky expression (Park et al., 2012). Therefore, it is critical to identify the transgenic lines that display the least leaky expression while maintaining highly inducible expression. To confirm non-leaky expression of Xa21, selected lines should be fully susceptible to Xoo in the absence of DEX and resistant to Xoo after DEX is applied. Additionally, Xa21 gene expression and protein abundance should be low or not detectable by quantitative RT-PCR and western blot analysis before DEX treatment and should be induced by DEX application (Park et al., 2012). To ensure dexamethasone treatment is successful, inoculate additional plants and maintain without harvesting leaves to measure lesions 12 to 14 days after inoculation. In our experience, when we used separate walk-in growth chambers for dexamethasone and non-dexamethasone treatments, we observed variation in Xoo lesion lengths between Kitaake (dexamethasone treated) and dexamethasone-inducible XA21 plants (non-dexamethasone induced) even when identical settings were applied to both walk-in growth chambers (data not shown). 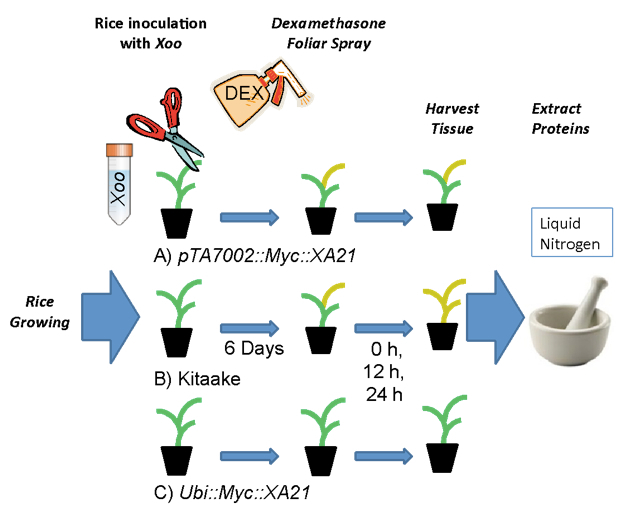 Therefore, we recommend limiting experiments to a single growth chamber in which dexamethasone is applied to all plants and Kitaake wild type rice are used as controls. Plants were transferred to walk-in growth chambers for inoculation with Xoo due to University biosafety protocols. The authors suspect that Xoo inoculation and dexamethasone application should be successful in the greenhouse as well, although these conditions were not tested. In our pre-experiments, we combined a 30 μM dexamethasone foliar application with 10 μM dexamethasone irrigation. However we didn’t see additional Xa21 expression compared to foliar application alone (data not shown). This protocol was modified from Park et al. (2012). This research was supported by the National Institute of Health (NIH, GM55962), the National Science Foundation (NSF, IOS-0817738), and the Monsanto's Beachell-Borlaug International Scholars Program. Aoyama, T. and Chua, N. H. (1997). A glucocorticoid-mediated transcriptional induction system in transgenic plants. Plant J 11(3): 605-612. Padidam, M. (2003). Chemically regulated gene expression in plants. Curr Opin Plant Biol 6(2): 169-177. Park, C. J., Canlas, P. E. and Ronald, P. C. (2012). Establishment of glucocorticoid-mediated transcriptional induction of the rice XA21 pattern recognition receptor. 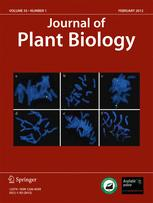 J Plant Biol 55(1): 43-49. Park, C. J., Lee, S. W., Chern, M., Sharma, R., Canlas, P. E., Song, M. Y., Jeon, J. S. and Ronald, P. C. (2010). Ectopic expression of rice Xa21 overcomes developmentally controlled resistance to Xanthomonas oryzae pv. oryzae. Plant Sci 179(5): 466-471. Song, W. Y., Wang, G. L., Chen, L. L., Kim, H. S., Pi, L. Y., Holsten, T., Gardner, J., Wang, B., Zhai, W. X., Zhu, L. H., Fauquet, C. and Ronald, P. (1995). A receptor kinase-like protein encoded by the rice disease resistance gene, Xa21. Science 270(5243): 1804-1806. Zuo, J. and Chua, N. H. (2000). Chemical-inducible systems for regulated expression of plant genes. Curr Opin Biotechnol 11(2): 146-151. Nucleotide sequence of Myc::Xa21. The underlined region defines the N-terminal Myc tag.The Myc tag was inserted in domain B of the Xa21 gene following the putative signal peptide (domain A) as previously described (Park et al., 2010). SP signal peptide, RB right border, 35S cauliflower mosaic virus 35S promoter, GVG GAL4-binding domain, VP16 activation domain–glucocorticoid receptor fusion, E9 poly (A) addition sequence of the ribulosebisphosphate carboxylase small subunit (rbcS-E9), NOS-P nopaline synthase promoter, NOS-T nopaline synthase terminator; 6×UAS six copies of the GAL4 upstream activating sequence and the −46 to +1 region of the 35S promoter, 3A poly (A) addition sequence of the pea rbcS-3A, LB left border. How to cite: Caddell, D. F., Wei, T., Park, C. and Ronald, P. C. (2015). The Use of a Dexamethasone-inducible System to Synchronize Xa21 Expression to Study Rice Immunity. Bio-protocol 5(9): e1468. DOI: 10.21769/BioProtoc.1468.